To help utilities source solutions without the rigid formalities of a request for proposal (RFP) process. Opened at least 16 major proceedings since launching in 2014. 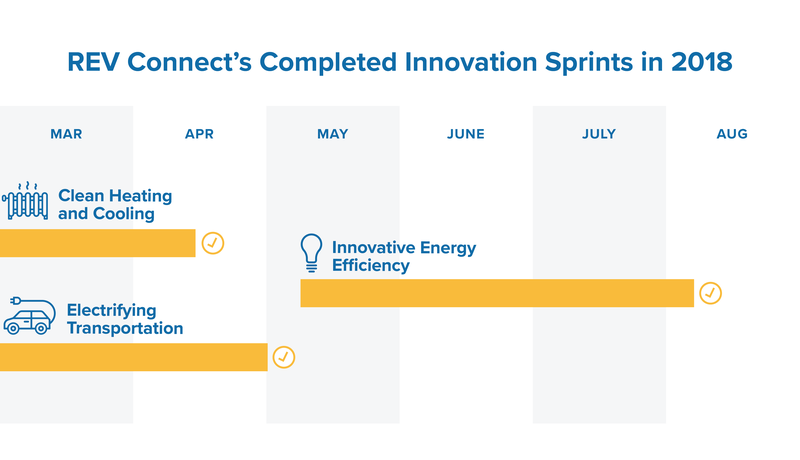 The project's energy storage Innovation Sprint is expected in the second half of 2019. Let's be clear: Anything that can take the torturous rigidity out of utility procurements deserves an award. New York's Reforming the Energy Vision has been around a few years, and the state's efforts to reshape the utility sector are beginning to pay off. Plenty of states have followed suit, but New York's REV is a holistic reimagining of energy resources and the business models underpin the sector. While REV aims to bring about wholesale changes, one initiative within it is speeding the development of new resources and solutions while helping remake utility procurement processes. Defining REV Connect is difficult, because on paper it is an online portal matching New York utilities with vendors. But in practice, REV-C represents a radical way for utilities to approach problem solving without the rigid formalities of an RFP process. The idea was conceived a couple of years ago by the New York State Energy Research and Development Authority as "a bridge between utilities and the market for innovation," according to NYSERDA Senior Advisor Jon Gordon. "We recognized that it may be difficult for them, new entrants into space, technology companies that had not traditionally played in the energy space. It can be challenging to find the right person to connect with," Gordon told Utility Dive. But connecting and accelerating are what REV-C is all about. It's been running for about a year now without an end-date, drawing 250 submissions that generated 150 connections between utilities and market participants. NYSERDA says there are currently 11 partnerships in development, and a couple others very close to that stage. Utilities can post areas of interest to the portal, which then draw submissions from the market using a one-page submission. The submissions go to Navigant, which works to shape, improve and structure proposals a bit. The best ideas are eventually presented to a utility. It didn't always work this well, however. "When we first began this with utilities, they were a little hesitant, reserved, skeptical," said Gordon. "They weren't sure why we were doing it. But utilities have really embraced the REV Connect process and are seeing the benefits. "When we first opened the portal, the number of submissions received in the early days were disappointing," Gordon said. What jump-started REV-C was the creation of "Innovation Sprints," which are concentrated blocks fo time when vendors and projects focus on certain topics. So far this year the sprints have tackled clean heating and cooling, efficiency, and electrifying transportation. The submission deadline for an energy storage sprint is expected in the first half of 2019. It's an open-ended process "where ideas are kicked around and shaped in real time," said Gordon, likening it to watching a speed dating event crossed with Shark Tank. Traditionally utilities procure through an RFP process, but "utilities recognized you can't prescribe solutions in an innovative marketplace," he said. Some utilities still go ahead with an RFP process, but in these instances REV-C greatly streamlined the process and helped to reduce procurement process. Several utilities, Consolidated Edison and National Grid, for instance, are right now interested in advanced metering network access solutions. While REV-C doesn't have an end date, NYSERDA does want to eventually stop managing the program." Our plan for 2019 is to institutionalize the process at utilities," said Gordon. "We see a day down the road where utilities will do this on their own … we led the way and built it. We'd like to turn the keys over to the utilities." Locational value of DER is essential to grid planning. So why hasn't anyone found it?